What is "Swamp Ash" tone wood? As far as I can figure out “swamp ash” tone wood is a marketing thing and not a real species. From what I have seen it looks just like the white or green ash normally found around here. Maybe some of you luthiers can set me straight. Always looking for figured hardwood lumber!!! Re: What is "Swamp Ash" tone wood? I really don't think that I want anymore Ash like that anymore though. Give me the regular Ash. It surfaces and sands really nicely and I do not understand why so many people prefer Red Oak to it. Red Oak is porous and will not finish smooth with out grain filling. Ash is a bit brittle, but I think that it is a great hardwood and wonder why it is not more highly regarded anymore. Just my opinion, but around here what we call swamp ash is black ash (Fraxinus nigra Marsh), and it is garbage, not even worth burning. Could just be a local thing though. Mike gave me a clue... lightweight. Here is a Les Paul guitar out of swamp ash. It is quite attractive although it is a two piece body. I think it would have looked better with a good book match. 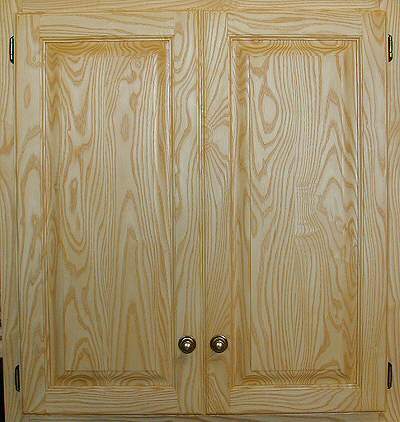 Picture is cabinet doors I made few years ago. What I call white ash...still looks about the same. Yeap, I didn’t do a good book match either. I would like to find out for sure what “swamp ash” means to the luthier...maybe a term somewhat different than what most people would think? now folkes edcate in ignorant foreigner, what be a Luthier? I'm thinking it isn't a Lutheran minister fella who makes cabinetry is it? Until someone smart answers I will give a stab at an answer. A Luthier is a maker of guitars. Black ash isn't light, it's denser and heavier than white ash and is slower growing. I do think I've heard it called 'swamp ash', but it's not worthless if you find a nice sound one. Most of it, of any size, is dying off around here. I cut and milled a black ash from the U.P. of Michigan that's beautiful wood. It has a bit of a reddish hue to it, and it's just waiting for me to build some projects with it. All I've done so far is run some through the planer, and it's really quite beautiful wood--certainly worthy of using. It's definitely different than white ash, which I assume is the typical ash found at most woodworking stores. The difference is that reddish hue I mention. Once I finish a project with it, I'll post some pictures--I think I'm going to make a mirror frame in an Arts & Crafts style with some hooks to put in my entryway, FWIW. What was used for baseball bats before they started building those arificial ones out of aluminum? White ash for most bats. There is also a green ash - Fraxinus pennsylvanica It also grows on stream banks and swamp borders. I wonder if this would qualify as swamp ash as well? Anyone run into blue ash? Grows on dry limestone uplands in the Ohio and Mississippi valleys. Hope I didn't offend anyone by saying swamp ash is garbage around here. The reason for it being considered less than desirable around here is it rarely gets bigger than 5" diameter. Just kind of takes up space. Any of it I have cut did seem to have a nice color to it, and if it was millable then probably would make nice looking lumber. I do know that some native cultures use black ash for basket making. Pretty sure they wouldn't call it "garbage"
They still pound black ash here at the local native reservation. You don't here them at it as often as they used to though. Nice to here that pouding sound when they are making it. It would be nice if a few more of the younger generation would take it up. Times are changing alot. My grandfather used black ash on a bridge to get to one of his fields, and the natives that lived over in Blaine, Maine used to lift it all the time. Much of our lowland hardwood areas contain black ash. I've sold and harvested some lowland areas of nice black ash sawlogs. We have one such area to harvest now once the "spring break-up" is over and the area dries out for better access and logging. I had an acre of black ash, pretty much a pure stand until the beavers moved in. The stand strandles a small brook that they damed after some serious harvesting took place near there in 1994. The rest of my woodlot is regenerating with mostly white ash mixed in. My area grows nice white ash, only trouble is that in late years it's been slaughtered to heavily. I like the grain of white ash, and it grows faster than sugar maple. Seems to grow well mixed with aspen and the moose don't bother it too bad, except for a scrape of the antlers once in awhile. "Swamp Ash is just waiting to resonate! This is the other "vintage wood" used in single coil type guitars from the 50’s and 60’s. The ash we use is lighter in weight and less harsh sounding than regular ash. It’s color is light blonde with darker brown grain patterns. This wood looks good in all transparent colors. Being located down in Louisiana, we know a little about swamp ash. All of the good ash grows in the swamps and bayou’s of the deep south. The best part of the tree is near the water line so we have to fight off the gators and snakes! T-Fred Boudreaux (Boo-Dr-O) is our main logger. Nothin’ scares him!" I don't deal in it myself but from what I gather it is either used in a bookmatched set or a one piece to form the body of the guitar. Usually a face and sometimes a back of 3/16" bookmatched figured wood in glued on the ash body (that's where I come in). Generally speaking, Swamp Ash is a proprietary name for southern Ash that is soft texture, bright sapwood color and unusually light in weight. In my experience, the only difference between good Southern White Ash and Swamp Ash is the weight of the board. I wrote a blog article on this very topic last year. "slanted" or "bent" band blade? For wood? Page created in 0.932 seconds with 39 queries.